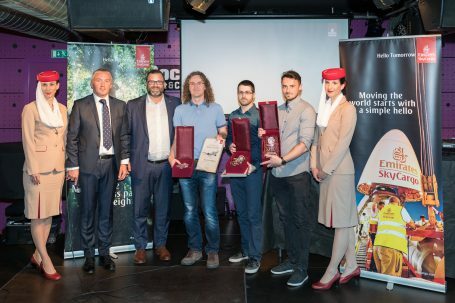 Emirates SkyCargo, the freight division of Emirates, honoured its top cargo agents in the Czech Republic with a special achievement awards gala evening held at the Jazzdock in Prague. On behalf of Emirates SkyCargo, awards were presented by Bořivoj Trejbal, Emirates Country Manager for the Czech Republic and Jakub Kolář, Emirates SkyCargo Manager, to the top agents for their commercial achievements and use of Emirates SkyCargo services in 2017. The top three agents were Richard Jaš from DHL Global Forwarding (CZ) s.r.o., Martin Gregor from Kuehne + Nagel, spol. s.r.o. and Lukáš Sůva from PANALPINA Czech, s.r.o. Emirates SkyCargo has been facilitating trade between the Czech Republic and the world since 2010 with its once daily flight serviced now by its flagship Airbus A380 aircraft. Moreover, during July 2018 Emirates will add a second daily flight between Prague and Dubai that will be operated by Boeing 777-300ER. “We are delighted Emirates will offer additional cargo capacity and enhance trade links by providing Czech companies further opportunities to export,” says Jakub Kolář, Emirates SkyCargo Manager. Emirates connects the Czech Republic with more than 150 destinations in more than 80 countries and territories around the world. Among the most popular Czech exports shipped by Emirates SkyCargo are Bohemian crystal, engineering products and spare automotive parts, which are regularly distributed to markets in the Middle East and beyond. Emirates SkyCargo carries up to 15 tonnes of cargo on its daily flight to Prague in each direction.